This video should make people extremely angry. 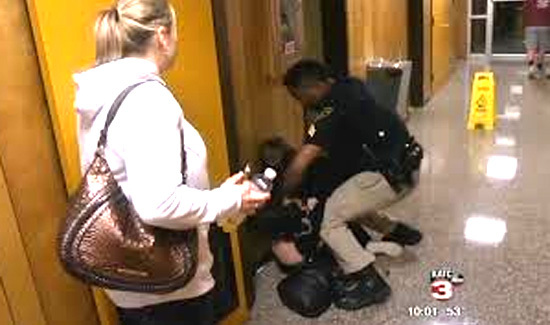 A teacher speaking at a public meeting in Louisiana was arrested recently- for speaking at a public meeting. While that’s not at all true (academy classes are full where the pay is decent) there are a lot of recruiters and managers talking about the fact that people just don’t want to be police officers these days. Some say it’s “The Ferguson effect,”- a catch-all moniker designed to create the impression that police are too angry, frightened or both to get out of the cruiser and do police work. Others say it’s the controversial shootings and low pay. If you want to cut to the arrest just click here. But if you want to know what’s actually happening in this country right now, it’s worth watching the whole thing. Sao you don’t bother to list a lot of facts and the justification for the arrest. Most of your arricle is nothing but fluff. You are either ignoring or don’t know the facts. I don’t know if the arrest was justified because, I don’t know the facts. I did see her trying to resist and that caused her to be controlled. APB, did you suddenly get taken over by antifa? If you can’t give us facts so we can evaluate your position and form one of our own, then you are worthless. No. To our knowledge, we have not been taken over by Antifa. Thank you for your interest and thanks for subscribing to APB!